I must admit that I never thought I'd visit Barnet. 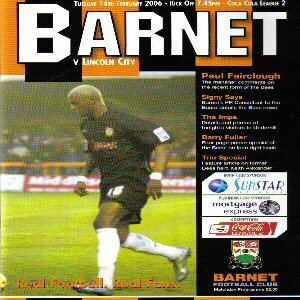 Mainly due to them being relegated but the usual Playoff Final defeat, this time to Southend, accompanied by Barnet's promotion from the conference meant a trip to Underhill was inevitable. The first time I went, I didn't know what to expect out of the ground, I'd seen a few pictures but none of them revealed anything in particular. For our visits, we'd been given one of the usual home ends, a pitch length terrace. This stand features a nice lovely slope which just gets worse as you go down. I'm generally a tall guy but stood in the middle of the stand, I was at the shoulder height of someone who is smaller than me but at the other end of the stand, that's how bad the slope is. The view out of this stand however is reasonable, with only the odd post in your way. 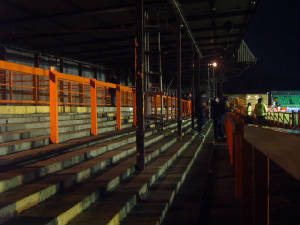 One thing I didn't like about this stand however was the fact that in my second visit, we were sharing the stand with several local chavs who seemed intent on not watching the game and one of them spent the whole game complaining to the stewards and I can't recall him once looking at the pitch. This made for a hostile atmosphere and unfortunately, they started throwing coins after we'd taken a 3-0 lead, not exactly a safe place to take your kids. 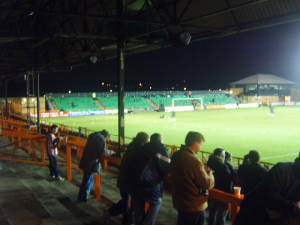 The stand to the Imps' fans right was a small terrace of just a few steps. There was no roof to this stand and the only thing that came with the stand, was a net that prevented the balls going into the nearby gardens, where several cheapskates were watching out of as they were too cheap to pay to watch the game. The stand behind the far goal was that thing that every football fan hates, temporary seating, again this had no roofing but also no netting either. 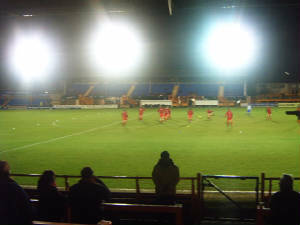 The final stand was another odd prospect and divided into 3 segments, the first of which was a small seated area towards the left hand side of the pitch, next to this was an elevated seated area and then finally another bit of terrace, not a pretty picture to say the least. 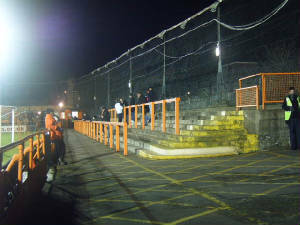 It is quite easy to create an atmosphere at the ground but other than the local chavs, there is no sound coming from the Barnet fans and those chavs quickly went quiet after City started winning. Overall, it's not a bad ground to visit, could be a lot worse but it's definitely not football league standard and I'll be honest, I wouldn't exactly be heart broken if I didn't have a chance to come here again.